This Off-Broadway musical from the early '90s spins a dark tale of a talented little 8-year-old girl who kills her rival to get a part in the school play. And the killing doesn't stop there. Tina is doted on by her mother Judy, and attracts the attention of talent agent/coach Sylvia. When Tina loses the lead role of the original musical Pippi Longstocking in Tahiti, written by the teacher and former performer Miss Thorn, to the less talented Louise, she takes matters into her own hands. Her mother is at first shocked that her daughter would go to such lengths to perform, until she realizes her own talent and connection to show business. This wickedly funny tale is gleefully performed by the cast in a deliciously campy style. One of the great things about this piece is each actor gets at least one big song in which to show their talent; no one sits in the background for too long. In the larger roles, Bethany McCade is adorably mischievous as Tina, Christine Wade is wonderful (and what a voice!) as the perfect housewife turned diva, and Susan Hofflander is a hoot as Sylvia. Supporting players, some playing multiple roles, also shine: Ruthie Baker gives a hilariously plaintive lament in "Teaching Third Grade," Greta Grosch brings the house down with a song that anyone who loves musicals will love - "I Hate Musicals," and Deidre Cochran gets two big moments - the silly "Pippi Song" as Louise and as the All About Eve character. And even though they all refer to scripts, they still milk every moment of camp and comedy, and director Lindsay Redman has them moving around the space enough to make it interesting. 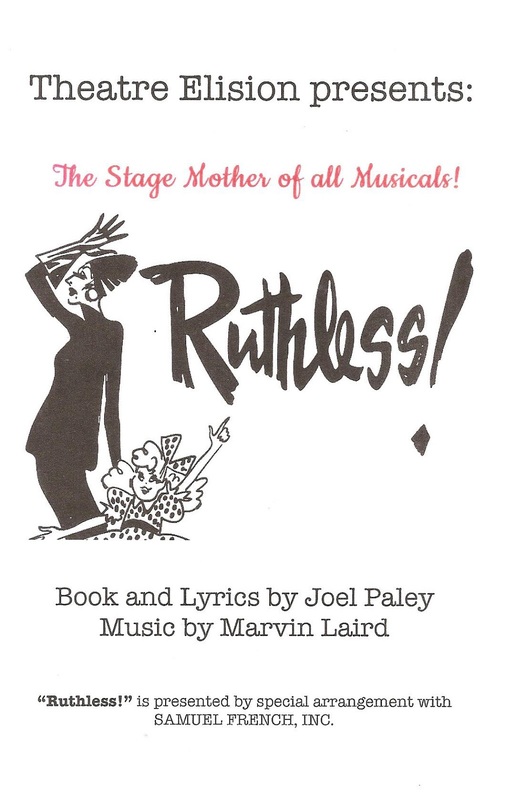 The cast is accompanied by a sparse band, Music Director Harrison Wade on piano and Erik Schee on drums, who also get involved with the action in a way I won't spoil here, but is one of the comedy highlights of the show. The musical highlight is the group number and title song, with some incredible harmonies coming from these six women. And the best part is - they're unmiked and sound fantastic in the small auditorium of the Howard Conn Fine Arts Center. 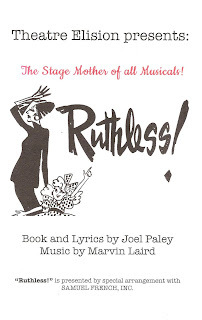 Darkly hilarious, gorgeously sung, cleverly written, campily performed, a spoof of the entertainment industry and shows we love, Ruthless! is a super fun 90 minutes that you should add to your weekend schedule. Tickets are just $20 - find out more information and order tickets here.